Autor/s: Alamús, R.; Palà, V.; Tardà, A.; Pipia, L.
Nocturnal light pollution is a side effect of industrial civilization and accounts for excessive, misdirected or undesired artificial light produced by dwellings, factories, offices, sport fields, billboards, street lights and so on. Metropolitan areas account for 75% of the world’s energy consumption and much of its CO2 emissions. For instance, in Spain, in some towns and cities, public lighting is responsible for 50% of power consumption. Thus, street lighting is one of the sectors with a larger potential in energy saving (between 30% and 40%): lighting and management systems are nowadays being developed and improved, by using more efficient lights with less energy consumption. Concerning data acquisition as a part of such methods, space-borne imagery provides a moderate spatial and spectral resolution (currently available from instruments on board satellites and space platforms, such as the data taken by DMSP and SUOMI satellites or taken from the International Space Station). Such data have limited spectral bands and coarse spatial resolution, and the dynamic range of the sensors is optimized for daytime rather than nocturnal capture. 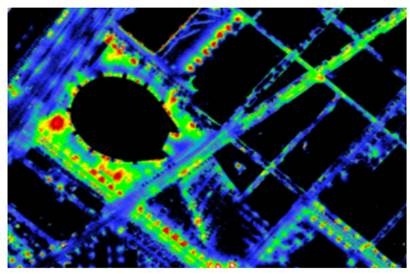 Accurate quantification and characterization of artificial light radiated at ground level from remote sensing imagery requires high spectral and spatial resolutions, with a high dynamic range. Images with these characteristics can be achieved with airborne hyperspectral imaging spectrometers. At the Institut Cartogràfic i Geològic de Catalunya (ICGC) we have developed a methodology to fusion data simultaneously recorded with a hyperspectral sensor (an AISA Eagle II from SPECIM), which combines synoptic view with multiple narrow spectral bands, and a digital photogrammetric camera (a DMC‑I from Z/I-Hexagon). As a result we are providing to local authorities luminance maps at a resolution up to 0.25 cm and maps of main source of lights (incandescent, mercury vapour, high pressure sodium vapour, metal halide and light-emitting diode-LEDs) at a resolution up to 1.5 m.
AISA Eagle II is a hyperspectral VisNIR pushbroom imager manufactured by SPECIM. The instrument operates by looking down in a fixed direction and imaging successive lines of the flown scene, building up a two-dimensional image as the platform moves forward (main parameters are described in table 1. Table 1. AISA EAGLE II main parameters. DMC is a high-resolution photogrammetric frame camera, manufactured by Z/I imaging (currently Hexagon) (Dörstel 2003), which simultaneously captures one high-resolution (HR) panchromatic and four low-resolution (LR) multi-spectral (red, green, blue and near-infrared) images (main parameters are described in table 2). Table 2. DMC I main parameters. Methodology begins with an appropriate flight plan. Data is acquired in a single nocturnal flight where both sensors (AISA and DMC) are operated simultaneously in an airborne platform, which is able to carry both sensors. As the goal is the analysis of artificial nocturnal lights, it is required to avoid natural light sources, which means avoid moon light. Because of that flight is performed close to the New Moon phase or the nights when moon has been already set. This section is dedicated to the description of the retrieval of luminance from the hyperspectral sensor and later fusion with the photogrammetric camera data. For each pixel, the VisNIR sensor collects a spectral sampling of the radiation in 400-900 nm spectral range emitted by the surface. As luminance map must represent how the human visual system perceives the radiance of light at ground level, the radiance values of the 126 AISA sensor bands must be converted to luminance values at ground level and then combined in a way which mimics the visual perception of human beings. The conversion from measured radiance to luminance at ground level is performed in several steps. Firstly, a radiometric calibration converts digital numbers captured by VisNIR sensor into radiances at flying height. These radiances are transferred to radiances at ground level by compensating for atmospheric hyperspectral attenuation and combining the 126 radiances recorded per pixel using the photopic luminosity function. Finally, a low resolution luminance map (at a resolution of 1.5 m GSD) of the entire area is created by mosaicking the flight tracks of the hyperspectral sensor. Figure 1 shows a detail of the low resolution luminance map segmented into 10 classes from 0.35 to 10 cd/m2. The fusion consists of fitting the radiance values of DMC images to the luminance map retrieved from the hyperspectral sensor. Once this calibration process has been completed, the luminance map at 0.25 m GSD can be computed from DMC imagery alone. Figure 2 shows a detail of the high resolution luminance map segmented into 10 classes from 0.35 to 10 cd/m2. Concerning the luminance absolute estimation, the radiometric information was preserved in the DMC map generation process. Notice that it is easy to verify that the information retrieved using the AISA for luminance values higher than 1.5cd/m2 has been preserved. Moreover, the lower noise floor of DMC has enhanced the dynamic range of the retrieved luminance from 1.5 cd/m2 down to 0.35 cd/m2. Hyperspectral and multispectral airborne sensors have been often used for nocturnal image analysis. Yet, all these studies have been focused on the detection of artificial light sources or classification based on specific spectral signature detection. As shown in figure 3, artificial light sources have specific spectral signatures. 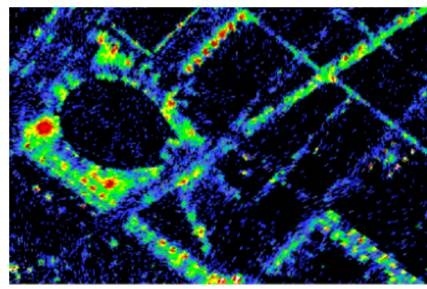 The hyperspectral capabilities of the AISA Eagle II sensor allow deriving a set of spectral indexes focusing in particular features of the light spectral signatures, which are used to discriminate them. Figure 3. Spectral signature of usual different types of artificial light sources. (Units on x-axis are nanometers). In order to overcome the relatively low intensity of artificial light at night, it has been designed a two steps strategy. Firstly, punctual source lights and their illuminated neighborhood are detected in the DMC nocturnal images. Secondly, a set of light spectral indexes is computed as a weighted average of spectral indexes derived from the AISA hyperspectral data. Taken profit of the different spectral signatures of the light sources (fig 3), a set of indexes has been derived. The next figure (figure 4.) shows a detail of the resulting light source type map. Classification is as follows: in yellow high-pressure sodium lamps, in orange metal-halide lamps, in blue mercury vapor lamp, in green fluorescent lights, in violet LED lamps, in red halogen or incandescent lamps and in grey not classified lamps. Figure 4. 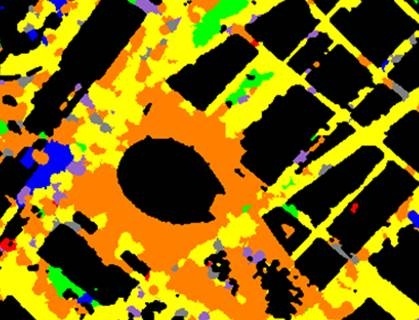 Light source type map derived from hyperspectral sensor.